The one-channel Axis M7001 Video Encoder offers a highly compact design with superb H.264 performance. It provides an easy and cost-effective solution for integrating small or large numbers of analog CCTV cameras into an IP-based video surveillance system. 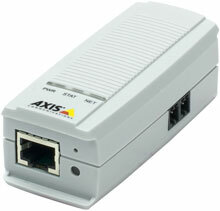 The palm-sized, standalone Axis M7001 Video Encoder is designed for installation close to an analog camera. It supports all types of analog cameras including PTZ (pan/tilt/zoom) and PTZ domes. Axis M7001 Video Encoder is perfect for small and large analog video installations, especially where an IP network infrastructure is already in place. Its small size also makes it ideal for use in discreet surveillance applications, for example, in retail stores and banks, and in camera housings. The Axis 0298-001 is also known as AXC-0298-001	or 0298001	.